The Explorer Dive Boat is the perfect diver's dive boat! We board no later than 7:15am and depart from Ventura Harbour heading to the Channel Islands with up to 3 dives; made to order breakfast and lunch, tanks and weights (and 1 adult beverage compliments of In2Deep) all included! We return at approximately 5:00pm. Personal items are your own responsibility which may include: dry bag, dry towels, change of clothes, sunscreen and seasick medication. A scuba certification card is required unless you are there for an open water class. If you want to stay on board the night before, bunks are available, be sure to let us know so we can make your bunk assignment. 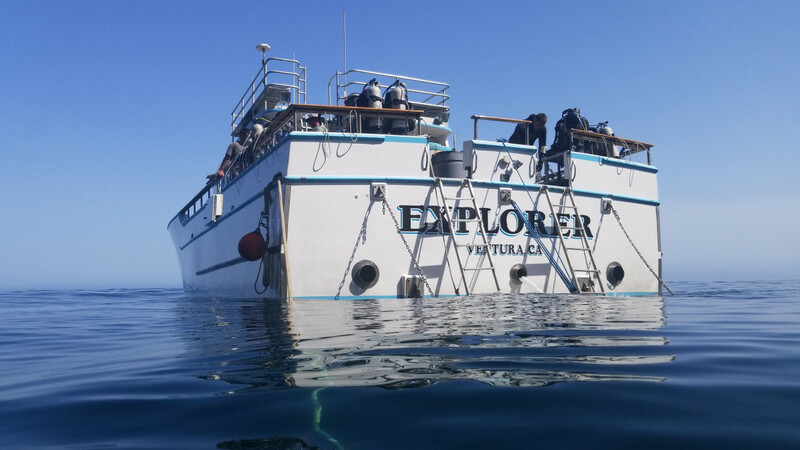 Explorer Dive Boat is located at Ventura Harbor, 1583 Spinnaker Drive, Ventura, California, 93001, Dock D-11 (Directly behind the Greek Restaurant). Destination and schedules are subject to change due to weather and ocean conditions at the time of departure.